Have you ever played Mario Kart? You know that level, the rainbow road, that so many people are so afraid and so many enjoy at the same time? The one that kind of became a meme on the internet for a little. Well, as a kid I always thought that it could be based on reality. I know there is no evidence to even remotely make anyone believe that any of the levels in the game can be real. I was not the smartest child in the world. I probably wasn’t even the smartest in the room usually, so I ended up believing most things. One of those things was that there was somewhere a rainbow road which was being kept a secret from the young people, since they did not want us riding it. I told this theory to my cousin and he, being 6 years older and a little bit of a bad influence, told me that I was right. He even told me that there were clues scattered in the popular culture pointing towards the existence of the rainbow road. He pointed my attention towards the fact that every culture had a legend for a rainbow, which implied you could travel on it or using it. Then, to mess with me further, he showed me the song “Somewhere over the Rainbow” by Israel Kamakawiwo’ole. I started freaking out – if there is so much told about rainbows in popular, how is it not possible to travel on the rainbow. His face got all serious and he said “It’s possible. All you have to have is a Ukulele”. So this list of Best Ukulele for Beginners is for those looking to travel the rainbow. Starting a musical career isn’t easy, especially when you are unsure of what you need, other than the instrument. I mean who wants to research every single item they might ever need and then go ahead and keep buying them up separately and run up a tab, when you don’t even know if you need all of them, for sure? Which is why I love some bundles for beginner players, and so do guitar manufacturers. Oscar Schmidt OU5 Koa Ukulele Bundle is one of the best starter sets to begin your descent, or ascent, into the world of uke. 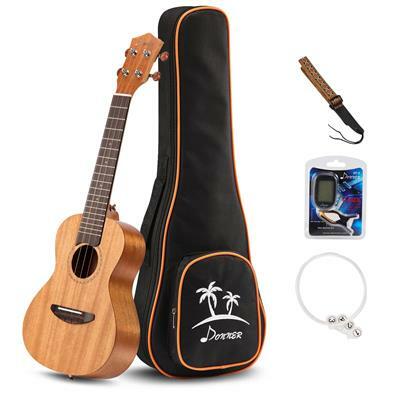 The bundle contains everything you will be needing as a beginner – a bag for transportation, a tuner, a basics guide DVD and, most importantly, a pretty decent ukulele. Making your life easier has never been, well, easier. You will be able to start off with all the basics covered and not worry about what you will be needing. Bundles, bundles, bundles. This list, if you needed a hint, is composed of bundles and starter kits. Why? Because bundles and start kits are one of the best ways to pick up a ukulele. Themselves Ukes are not the most expensive instrument, definitely on the cheaper side. This means that you will be able to pick one up without having to worry about dropping too much money. 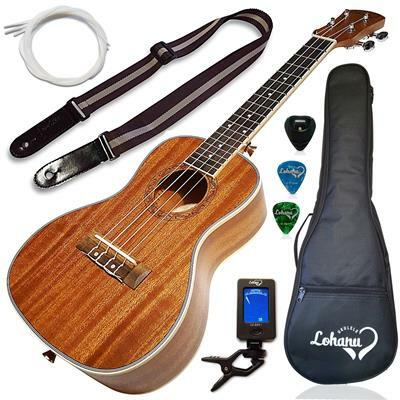 So why not pick up a uke as part of a bundle where you don’t have to end up spending on the accessories you will be picking up. The Lohanu Concert Size Ukulele is one of the best ukuleles to start your uke career with. It avoids a lot of the problems that ukes have, such as buzzing and easily going out of tune. Combined with a whole slew of essentials that come as part of the bundle, this is the most bang for your buck you’ll end up getting on the market. If you want something more affordable and below the 100 mark, then you might want to look at smaller bundles. This does not mean you will be getting a worse uke, just a small bundle. 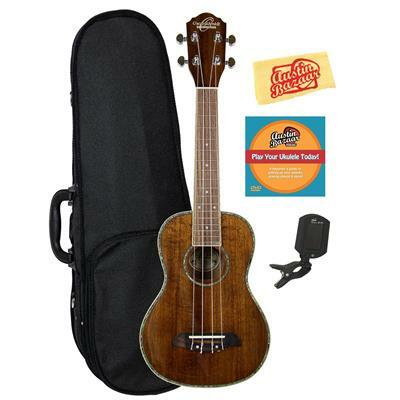 The Kala MK-C Makala Concert Ukulele Bundle is one of these more affordable bundles that you will find useful. The bundle itself has all the basics – gig bag, tuner and a basics DVD. You also get a decent ukulele that will be useful for you most of the time. It will cover the basics of your needs, giving you an instrument to practice on and to play with when your friends are around. While this might not be the best Ukulele on the market, it will serve you well enough, unless you decide to move into the professional Uke player world. You might have to get a new one if that happens, but till then, have fun with this one. Not all of the affordable options for Ukuleles need to look or sound more or less cheap. Some of these bundles will sound and look as good as some of the more expensive instruments on the market. The Hola! 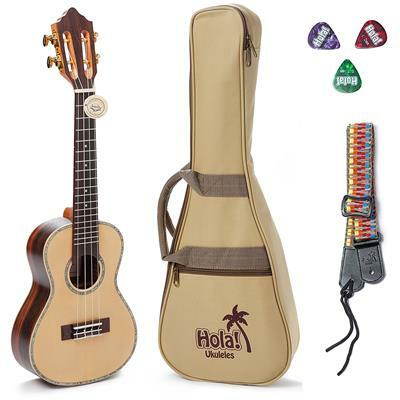 Music HM-427SSR+ Limited Edition Professional Tenor Ukulele Bundle is proof that cheap does not mean low quality. The look of the guitar, and the bundle itself, is quite outstanding. The gig back is shaped to contain the uke very well, while also protecting it from any potential damage in the future. The strap is colorful and cheerful, making the uke look as positive as it sound. The kit comes with a few nice picks that you will try your hardest not to lose. While it does not contain a tuner, the uke that is part of the kit is a very nice, sturdy instrument you will enjoy for a long time after buying it. Sometimes you want an instrument that strikes a nice balance between handsome and good sounding. Something that has a design that is both highly functional and appealing to the eye. 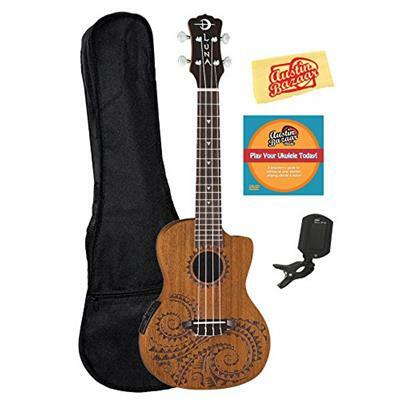 The Luna Tattoo Mahogany Concert Ukulele bundle has the Ukulele that you might be looking for. While the body design remains traditional and nothing exceptional to write home about, the beautiful “tattoo” around the instrument’s soundhole is definitely going to attract the attention of some of the more aesthetically inclined players and audience members. The bundle contains all of the basics that you would need – gig bag, tuner, DVD for beginners. The uke itself has a great sound thanks to its mahogany body. It is a very comfortable instrument to play, as it happens with ukuleles. The main thing is that you don’t start showing off the aesthetics too much and end up forgetting to actually play in an impressive manner. It is important to all of us to give you as many options in price range and quality of instruments we recommend to you as seem viable. We love to find the best and most affordable options that you can buy without much hassle and find use for as soon as you have the instrument. The Kala KA-15S Mahogany Soprano Ukulele Bundle is a very nice, affordable bundle for people of any background to pick up. Whether you are a beginner looking for a cheap beginning or a professional looking to pick up a “play thing” for recreational play, you will end up enjoying this instrument. The solid mahogany body of this Ukulele results in a very sophisticated sound for this often relegated to jokes instrument. 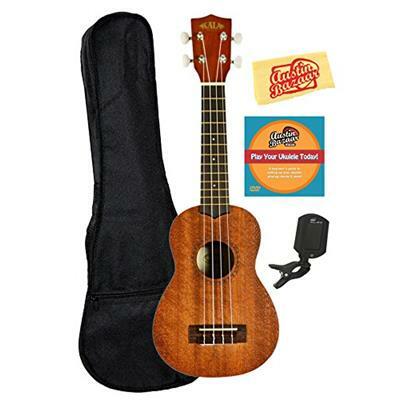 The instrument is durable and while not being outstanding in terms of playability and stability of sound, is adequate for anyone looking to start playing or pick up a cheap uke. 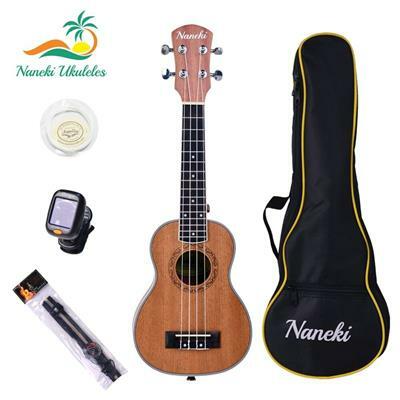 The Naneki Soprano Ukulele Bundle is a nice opportunity to purchase a very well made instrument for an incredibly affordable price. It is made with a combination of several exotic wood types, the ukulele sounds much better than its price would imply. The African sapele combined with mahogany and maple creates a beautiful combination that results in an exceptional sound within the price range. The ukulele is easy to play and fun to practice, which means every beginner will get to appreciate it. The bundle is very well arranged: buying it will land you a good quality gig bag, as well as a tuner, an extra set of strings and a strap. Everything you would need to play and keep your uke safe and clean, in one go, for under 100. 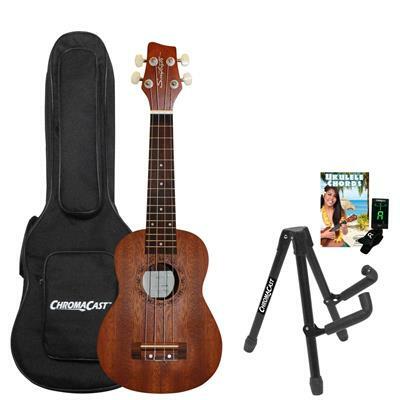 What else would a beginner need from a ukulele bundle? Maybe a guide or two, but it is easy enough to learn with the help of the internet nowadays, isn’t it? The traditional design of the Donner Concert Ukulele Mahogany DUC-1 Bundle is not its greatest asset, since this is the asset each one of the ukuleles on this list have. Its greatest asset is that it is one of the best sounding ukuleles in its price range. With a quality make and a great mahogany tonewood body, this uke will surprise many a player with its versatility and strength in sound. It does not waver, nor does it hum, which is unexpected of such a cheap instrument. Easy and fun to play, it has the added bonus of coming as part of a great bundle which includes a gig bag, tuner, strap and an extra set of strings just in case. It promises to be one of the most fun items in your collection. The affordable price of the uke is also one of its greatest assets and should definitely make you stop and wonder whether this is a deal you are willing to take. Some of the best things in the world come as parts of large bundles that contain anything your heart could ever hope for or desire. I mean think about it: friends come bundled with fun. Girlfriend and boyfriends come bundled with dates and warmth. Families come bundled with parents, grandma’s pies and a lot of good, relaxing times. 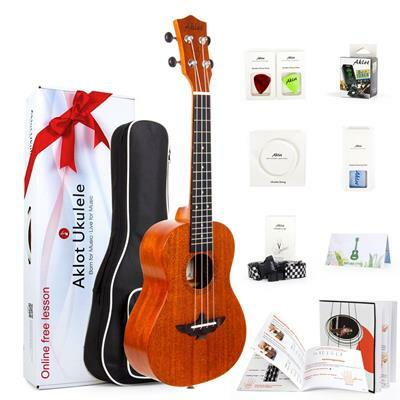 While ukuleles might not compare to any of these things, they do come bundled with positive vibes as well as, if it is the AKLOT Concert Ukulele Solid Mahogany Starter Kit, with everything else a uke player might need. A very nice gig bag, picks, tuner, strings and a nice little starter guide to teach those who know nothing the very basics of playing the ukulele. If price is a great problem for you than I have a great surprise for you: not everything great needs to be expensive. 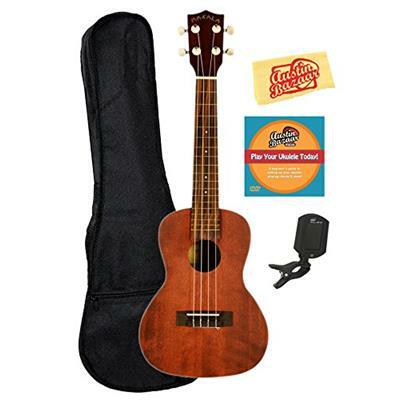 The Sawtooth ST-UKE-MS-KIT-2 Mahogany Soprano Ukulele bundle is a very affordable option for beginner players looking to start of on a cheap but solid note. With a fun design and a great color, this mahogany soprano delivers an adequate sound that beginners will find enjoyable and enough to entertain and practice with. The bundle the ukulele is part of is not extremely impressive, including a gig bag, a ukulele stand, a tuner, as well as a nice DVD to teach yourself some of the basic ukulele chords and playing techniques. Definitely a solid start to learn how to play over the rainbow or impress your girlfriend to be by singing the song from blue valentine. Though I do hope you play better than Ryan in that movie. So where does this marvelous instrument of pure cheer and joy come from? The history of the uke is just as beautiful and positive as the music it produces. Once upon a time in the 1880s, Portuguese immigrants from Madeira and Cape Verde decided to settle on the Hawaiian islands. These men and women brought with them a set of instruments and started performing every night on the island. The newspapers of the time reported the inhabitants of the islands being delighted by these concerts of small, guitar like instruments of Portuguese origin. The Machete, the cavaquinho, the timple and the rajao over the years of being part of the island life morphed into the instrument that we all love today: the Ukulele. The name of the instrument has its own origin story, different from the origin story of the actual instrument. Apparently long ago, the last monarch of the Hawaiian islands, King Kalakaua, enjoyed listening to a good ukulele performance. This was especially fortunate since one of his chief officers, a man from England by the name of Edward William Purvis, was especially adept at performing songs on the Ukulele. This man was short and fidgety, which, when he played the instrument, was especially amplified because of the technique required to play the Uke. Over time, according to legend, the name became synonymous with the instrument. Some people ended up deciphering the name as the “jumping flea”, referring to the size of the Englishman playing the instrument, and the way he moved both his body and fingers when he played. A beautiful legend as it is, it might not be necessarily true. Apparently the term ukulele was also in use long before the Englishman was born. It translation the term also means “the gift that came here”, which would refer to its actual origin of immigrants bringing new instruments to the islands, upon which the Ukulele would be based on. Whatever it is, the Ukulele became a popular instrument around the world, with the rapid expansion of american popular culture and music globally. Now you can encounter a ukulele anywhere in the world, as part of many a performance. The structure of the Ukulele is simple, resembling that of the stringed instruments related to the guitar. It has a body with a resonance chamber, a neck, fretboard, the tuning pegs, and the head. These are of course scaled down from the guitar version, as the uke is a smaller instrument. Still, the structure is very similar, if slightly smaller and for fewer strings. There is generally only one accepted technique of playing a ukulele – strumming. Once you pick up the Uke you will start to learn to strum. 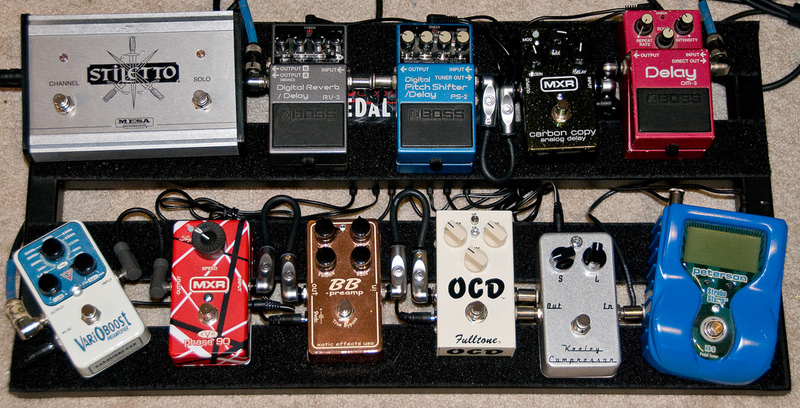 The fun is in learning to strum the many different ways to actually improve your sound. There are several different strumming patterns for playing the Ukulele. While it might seem easy for a professional to change up patterns at whim, for a beginner learning these patterns might take a little time, while learning to use them interchangeably and fluidly while playing might be a bit of a challenge if you have little or no background with stringed instruments. I suggest you sit down and keep practicing until you are confident of your skill. You could also use muting techniques and percussive techniques to increase the variety in your sound. Using your fretting hand to mute some of the strings on your ukulele will produce a nice effect for the sound. Similarly using your strumming hand to strike on the strings for a percussive effect will have a nice effect on your music and add that little bit of a twist you thought you might have been missing. I never got to ride the rainbow like I wanted to as a kid. People inevitably grow up and eventually realize that some things are plain impossible to do. I never even go to get the best ukulele for beginners as a kid, I had to borrow my friend’s ukulele. I didn’t return for a long time and he got a little more desperate for it than I anticipated he would. I told him that I was practicing every day and he would get it back eventually. The problem was, I could not give it back. When I borrowed it, after a few days of practice, I dropped it. Then in a confused frustration I may or may not have accidentally stepped on it. Twice. I was eight, don’t judge. I wanted to ride a rainbow, all I got was an instrument that I could not get into and ride onto the rainbow. The fallout of this behavior was of course a little less than pleasant. I had to apologize to my friend and my parents had to buy him a new ukulele. I was grounded for a few weeks, no TV, no cartoons, no fun. The worst part was not the grounding or the apology though. I kind of deserved those, for my frustration and for how easily I gave up. The worst part was my cousin laughing at me for believing the fact that I could ride a rainbow if I played enough Ukulele. It hurt my pride and my ability to trust people. I became a little smarter after this incident.